Sabré Cook, the American girl that won a lot with CRG USA, is about to move to cars and to launch a promotional initiative involving special holidays at the Viceroy Snowmass Hotels and Resorts in Colorado. Sabré Cook is ready to make her debut on single seaters after a series of very exciting and fruitful karting seasons in USA run with CRG-USA. The beatiful and strong American driver launced an interesting promotional initiative in collaboration with “Viceroy Snowmass Hotels and Resorts” in Colorado to face at best this new adventure in motorsport. Some holiday packages have been in fact devised with a special price to fund the sportive programme of Sabré Cook. “Viceroy Snowmass” is considered as one of the most famous resorts in the world located among the most beatiful mountains for skiing, right at the base of the famous skiing resort Snowmass. “Viceroy Hotels Resorts Residences” offers exclusive holiday packages in winter and summer in a location that is unique both in terms of natural beauties and offered services. Some holiday packages with special price have been devised within the initiative connected to Sabré Cook to support the forthcoming sportive season of the American driver. Further information will be availabe at www.viceroyhotelsandresorts.com/en/snowmass and www.sabrecook.com. SABRE’ COOK. Sabré Cook is 6 times winner of the Colorado Championship and won two USA TAG Junior International Championships as well as a TAG USA IAME Senior and the S2 title in Skusa Supernationals. 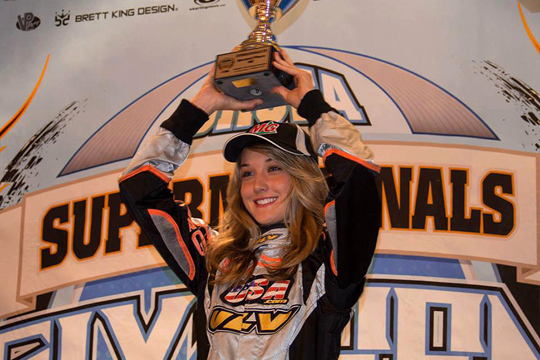 She has also finished second in Las Vegas' S2, fifth in the Skusa Summer Nationals in S2 and third in the USA TAG Senior. Beyond other important results, she also represented United States at the Bruno Grana International Trophy held in Lavalent (France), and obtained the fifth place in the CKI Florida Cup. A view of the Viceroy Hotels Resorts Residences.